Students and staff participate in 2014's Denim Day. 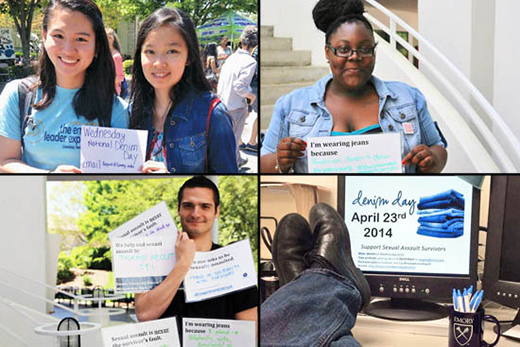 Members of the Emory community are encouraged to wear denim on April 22 for Denim Day, an annual event designed to raise awareness and support for sexual assault survivors. Emory's participation in the international event is sponsored by the Respect Program and the Intimate Partner Violence Working Group. On Facebook: "Emory University Respect Program"
The Student Government Association will donate $1 to the Respect Program for every photo of a student, staff or faculty member wearing denim on April 22 SGA receives. There will be a Denim Day table at Wonderful Wednesday from 12:30-2:30 p.m. and a table in the Rollins Café in the Grace Crum Rollins building from 11 a.m. to 1:30 p.m.
Also on April 22, several student groups that the Respect Program advises are collaborating to screen "It Happened Here," a documentary about sexual assault on college campuses which follows the story of five survivors and what they did following their assaults. The event is supported by the Respect Program, Sexual Assault Peer Advocates (SAPA), Grads Against Violence and the Alliance for Sexual Assault Prevention (ASAP). It begins at 7:30 p.m. in Harland Cinema; popcorn and refreshments will be provided. A panel discussion follows the screening, presenting a breadth of perspectives on how Emory is working to end sexual violence. Panelists include Dean of Campus Life Ajay Nair; Carolyn Livingston, Title IX coordinator for students; Respect advocate Wanda Swan; professor Pamela Scully, faculty adviser for SAPA; and doctoral student Casey Hall. Bri Pelura, ASAP events coordinator, will moderate.